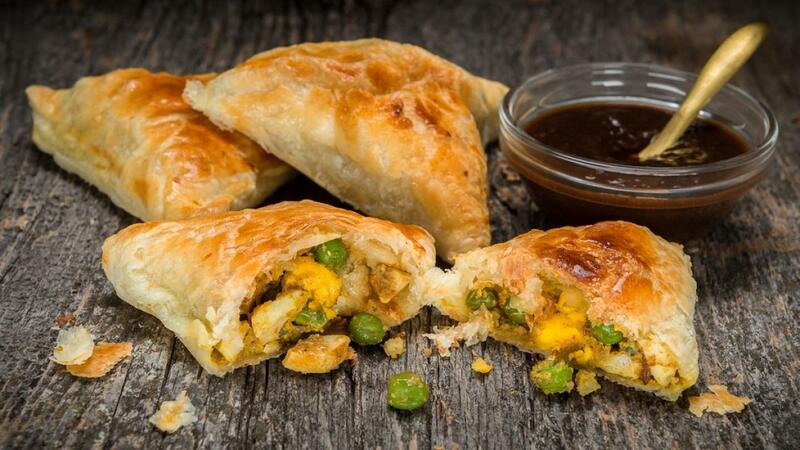 Cumin-scented egg and pea filling in puff pastry served with tangy-sweet tamarind chutney. Place all ingredients for the chutney in a blender or food processor and blend until smooth. Set aside. In a medium pot or pan, heat oil on medium-high. Add cumin seeds and coriander seeds and fry for one minute. Add green peas and mix in coriander, cumin, garlic paste, chili and turmeric. 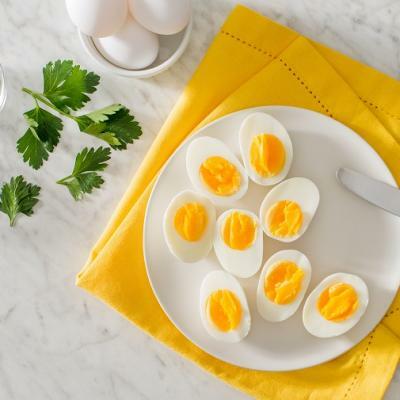 Fold in hard boiled eggs, lemon juice, garam masala, cilantro and red onion. Add salt to taste. Mix to combine. Set aside for 10-15 minutes to cool mixture to room temperature. Sprinkle all-purpose flour on a board or counter surface and roll out puff pastry into two 9” squares with a 1/4" thickness. Using a sharp knife cut each square pastry sheet into three even strips (6 strips in total, each strip will make 3 samosas, yielding a total of 18 samosas). At the top of one strip add 1 tbsp of cooled samosa filling. Fold top left corner downwards to meet right-side of pastry to create a triangle shape. Press firmly on the edges to seal the sides of the pastry and using a sharp knife cut across the bottom. Continue with remaining filling. Place on baking sheet and cook for 15-20 minutes until golden brown in colour. Serve with Tangy-sweet tamarind chutney. To get a nice sheen on top of samosas, brush with egg wash before baking.